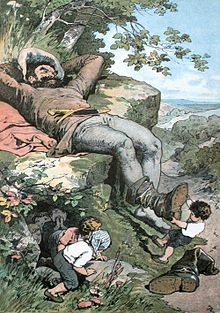 A fairy tale is a teep o short story that teepically featurs fowklairic fantasy chairacters, such as dwarves, elves, fairies, giants, gnomes, goblins, mermaids, trolls, unicorns, or witches, an uisually magic or enchantments. Fairy tales mey be distinguished frae ither folk narratives such as legends (which generally involve belief in the veracity o the events describit) an expleecitly moral tales, includin beast fables. The term is mainly uised for stories wi origins in European tradeetion an, at least in recent centuries, maistly relates tae bairns' leeteratur. This page wis last eeditit on 27 Mairch 2017, at 04:40.